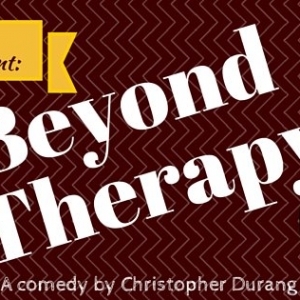 The University Players will bring Christopher Durang’s Off-Broadway hit comedy, Beyond Therapy, to campus for three special performances Nov. 6-8. Showings are scheduled for Friday and Saturday, Nov. 6 and 7 at 7 p.m. and Sunday, Nov. 8 at 2 p.m. at the Auditorium in Wieden Hall. All are invited to attend and $5 donations will be accepted at the door. Beyond Therapy is an off-Broadway contemporary comedy that focuses on two quirky characters deeply into therapy: Bruce and Prudence. Prudence’s macho therapist tells her to be more assertive, while Bruce’s wacky therapist suggests he puts out a personal add to meet women. The two meet and the conflict begins as Prudence tries to deal with Bruce’s male lover, and Bruce tries to figure out how to handle Prudence’s shy nature. The show premiered on January 1, 1981 at the Phoenix Theatre in New York, directed by Jerry Zaks. The subject matter handled in this play ranges from mental illness and health to LGBT love and marriage. The University Players was re-formed last year and works to provide students—and, in some cases, community thespians as well—with a way to express themselves through various theatre forms, such as plays, musicals, and festivals. To learn more about the University Players, visit the website at http://wp.umpi.edu/universityplayers/ or find its Facebook page by searching for “University Players at UMPI”. The intended audience for this play is adults, though all are invited to attend. Shows are scheduled for Friday and Saturday, Nov. 6 and 7 at 7 p.m. and on Sunday, Nov. 8 at 2 p.m. at the Auditorium in Wieden Hall. Admission is free, but $5 donations will be accepted at the door. Faye said the Players hope to welcome many campus and community members to the Nov. 6, 7 and 8 performances of Beyond Therapy. For more information, please contact Faye at darci.faye@maine.edu.